Accommodation for 6 nights & 7 Days in Mauritius. Daily Breakfast and Dinner in Hotel. One full day North Tour of Mauritius. One full day South Tour of Mauritius. One full day tour of Ile Aux Cerfs. Welcome to Mauritius. Arrive at Sir Seewoosagur Ramgoolam Airport and check into Hotel. In the afternoon you can spend your time at beach. Enjoy dinner at hotel. Overnight at hotel. Enjoy your breakfast. Today we take you for an exciting lle Aux Cerfs tour. An hours drive to the east coast would bring you to the coast from where we would travel by boat to Ile Aux Cerfs. This island is only a twenty minute boat ride away form the main island and perhaps has he best beaches in Mauritius. The island is truly beautiful and a wide variety of watersports may be availed. 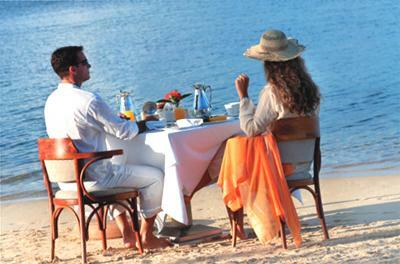 Ile aux Cerfs has two restaurants and a professional golf course too. Enjoy Dinner at hotel. Overnight at Hotel. Enjoy your breakfast. Today we take you for an exciting North Island Tour where you will Visit the capital of Mauritius where one could discover the fragrances and the spicy smell of the typical market of Port Louis.Not far away from the market is Le Caudan waterfront, a place for the whole family. This shopping centre offers a wide range of activities such as movie theatres, casino, boutiques, craft markets, and a lot of restaurants offering all sorts of international cuisines. Enjoy Dinner at hotel. Overnight at Hotel. Enjoy your breakfast. Today we take you for an exciting South Island Tour .During the South Tour, you would be taken to the Floreal factory shop near the eth town of Curepipe. A visit to Le Trou Aux Cerfs, an extinct crater in the centre of the island is a must for its amazing views on neighboring towns and vast agricultural fields. Following this, we would visit the sacred lake of Grand Bassin also commonly referred to as the Ganga Talao. The largest fresh water reservoir of the island - Mare Aux Vacoas is also visited.Not far from Grand Bassin, is the Black River Gorges National Park view point where one would enjoy a breathtaking view of the gorges merging with the Indian Ocean. A winding road leads from Case Noyale village to the coloured earths of Chamarel: an undulating landscape of different and contrasting shades of colours. The different shades of blue, green, red and yellow are apparently the result of the erosion of the volcanic ash. The neighbouring waterfalls of Chamarel rise from the moors and the native plant life. The site possesses a rare beauty. Some «Table d’hôtes» have been recently created in the Chamarel Village where you can enjoy the taste of typical Mauritian cuisine.Enjoy Dinner at hotel. Overnight at Hotel. Enjoy your breakfast. Today we take you for an exciting Undersea walk & Parasailing.Enjoy Dinner at hotel. Overnight at Hotel. Enjoy Breakfast. Today day is free for you, in free time you can enjoy more water sports activities & enjoy shopping in great malls of Mauritius.njoy Dinner at hotel. Overnight at Hotel.